Rocks coach Robbie Blake today responded to speculation linking him with the vacant Bradford City manager's job by telling Bognor: I'm loving life here and am fully focused on the club. According to the Bradford Telegraph and Argus, the former Bradford striker is one of a number of football figures being linked with taking over from David Hopkin, who resigned from the League One club on Monday. Blake has been at Nyewood Lane since the summer after three years on the coaching staff at Pompey, and has been a big hit with the Rocks fans. He told the Bognor Observer today that while anyone would be flattered to be linked with a job managing a League One club, he had not spoken to Bradford, or been spoken to by them - and did not expect that to change. Blake told us: "I think there will be a lot of people interested in the Bradford job - of course there will - but my focus is fully on Bognor. I love it at the club, Jack and everyone else and the fans have been absolutely great to me since I came and I love it here. "I've not spoken to Bradford and do not expect to. 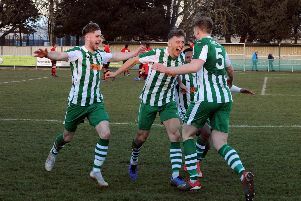 My focus is firmly on Bognor and in particular on this weekend's massive game with Worthing, in which we need to bounce back from last Saturday's defeat." Blake's words will be heartening for Rocks fans, who have taken to Blake since he arrived. It would be a major setback if they were to lose Blake less than a season after bringing him in to replace long-serving first-team coach Darin Killpartrick. But for now at least, Blake remains just one of many potential names being talked about for the Bradford job - and Bognor fans will hope that is the way it stays.